You’ve got snow up to your eyeballs and bored kids. Now what? 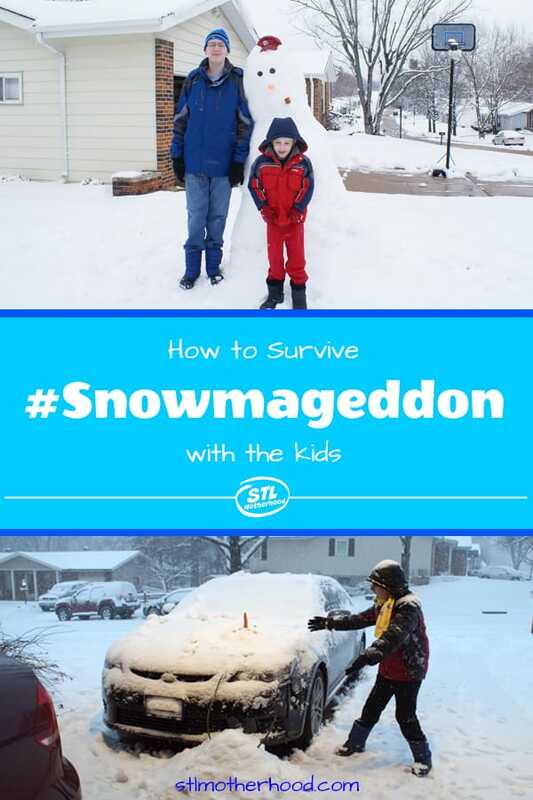 Here’s a few ideas on how to get through #Snowmageddon with your kids…and your sanity. 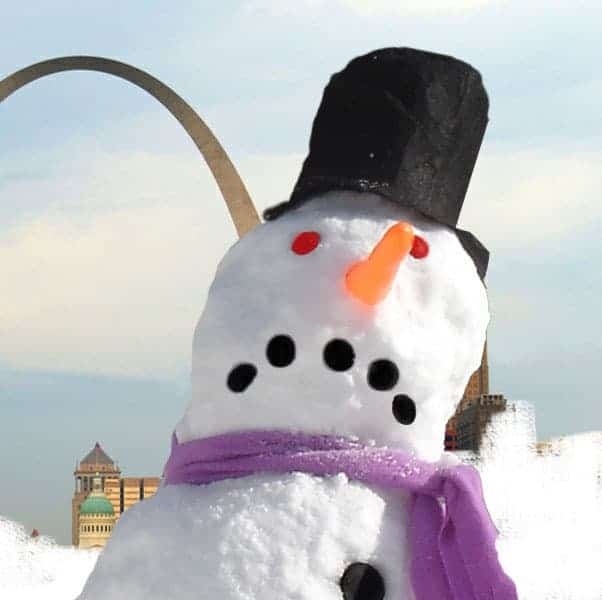 The Midwest is once again getting whacked with the worst snowstorm since 1982. I was 12 during that snow, and I remember it pretty well. The snow was so deep out in Jefferson County we had to blaze a trail out to the trees for my dog–and he was a 100 pound Alaskan Malamute! We’re talking deep, deep snow for us Missourians. Dad put both cars in the ditch–right in front of the house–and my neighbor called the National Guard to take her to the grocery store. Whew! 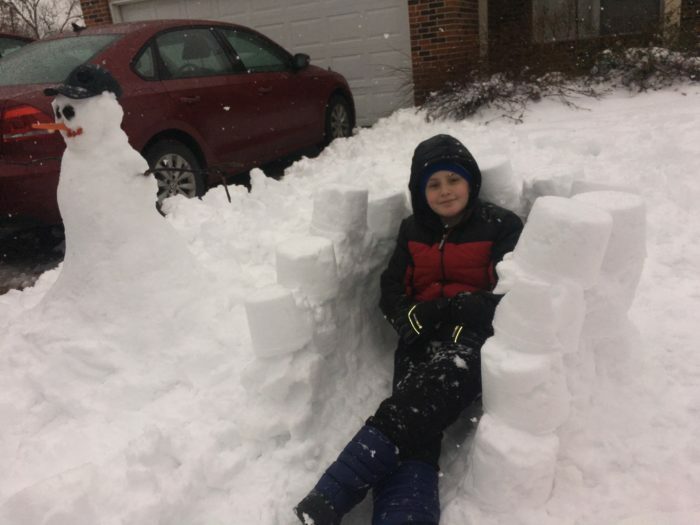 Hopefully you’re more prepared for Snowmageddon 2019 than my childhood neighbor. I think I saw most of you folks at Super Walmart last week, stocking up on chili beans, chicken noodle soup and Coleman fuel. 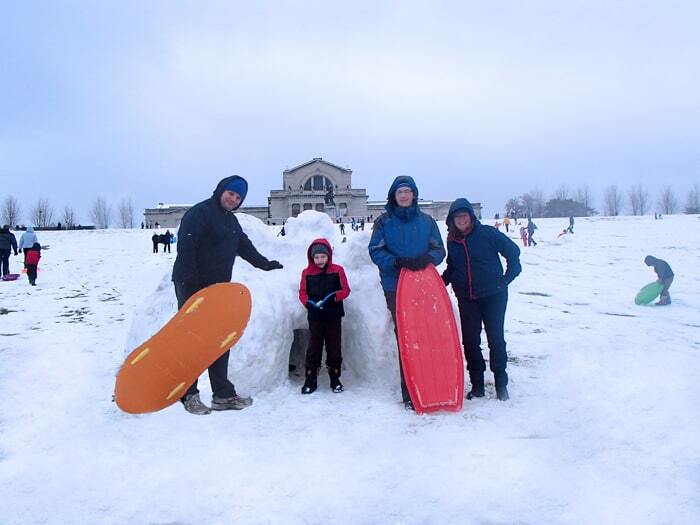 If you’re from around here, and you can make it to Forest Park…you have to tackle Art Hill. Here’s some tips on sledding from A Geek Daddy and how to make a quick sled out of stuff you might have around the house. 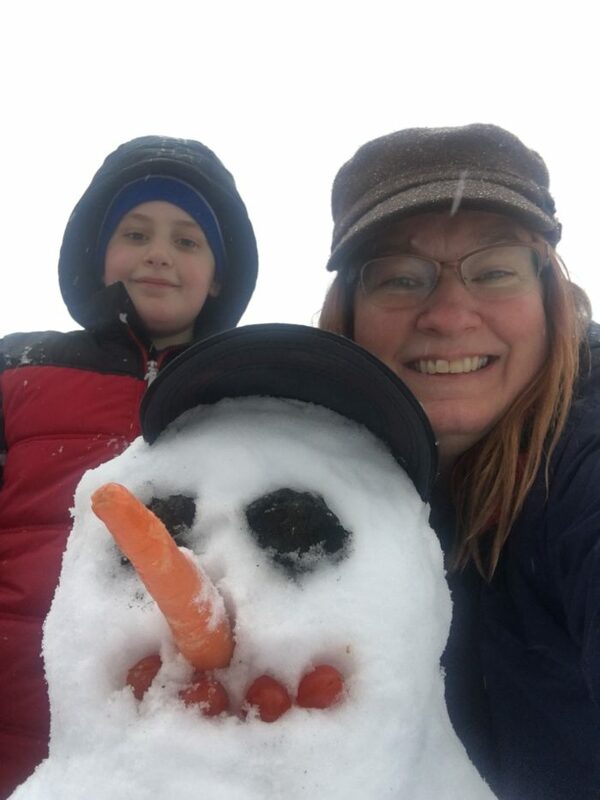 We’ve gone a couple years between decent snowman making weather, so maybe you need a few pointers? Mitch and I made this guy’s face with charcoal, a carrot and cherry tomatoes. We had so much snow this weekend that Mitch and I made a snow fort, using a couple plastic Easter buckets for molds. We got tired pretty quick, so we kept it small. If you’re feel like building something legendary, here’s a few tips from the Art of Manliness. Challenge the kids to create the best blanket fort ever! Use pillows, sheets, blankets, clothes pins and maybe even a couple chairs to make a snugly fortress. 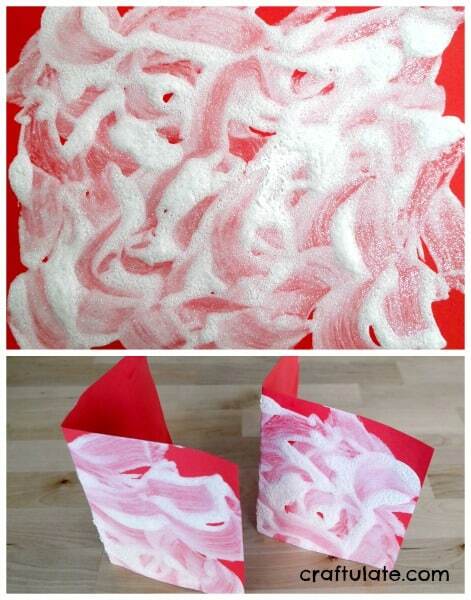 Grab a bag of cotton balls and plastic spoons and have a “snowball” fight that’s safe enough for inside. 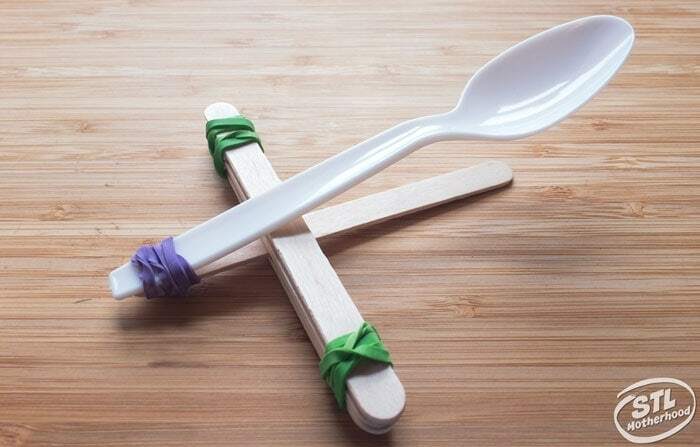 Use the spoons to catapult the snowballs at each other. In fact, you can upgrade that snowball fight with a couple spoons and rubber bands. Or a Nerf gun fight! 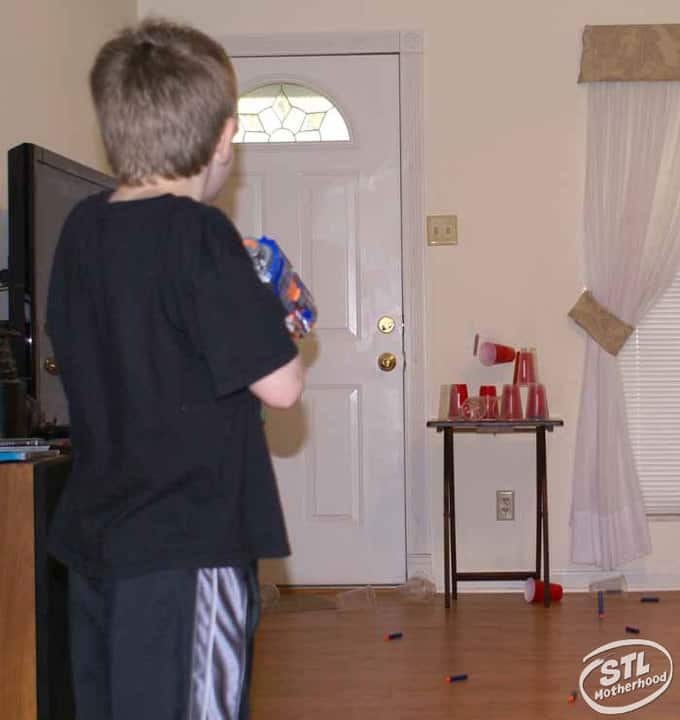 My husband often has the boys shoot “bad guys” on the TV with their Nerf guns. It lets the kids have a little fun while he’s watching Sunday news shows. (I won’t tell you who he defines as “bad guys.”) You could put on a movie and let them shoot at the screen whenever a bad guy shows up…it causes less arguments than if they shoot each other. 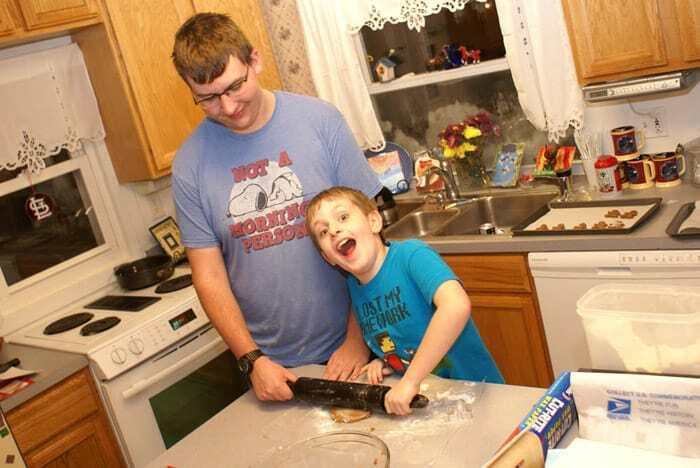 Bake something interesting with the kids. Let them mix the ingredients, roll the dough and really take part in the baking. If you didn’t pick up chocolate chips during your pre-snowstorm shopping trip, you probably have ingredients for sugar cookies. All cookied out? If you have packets of active yeast make some awesome soft pretzels. Or don’t bake…. 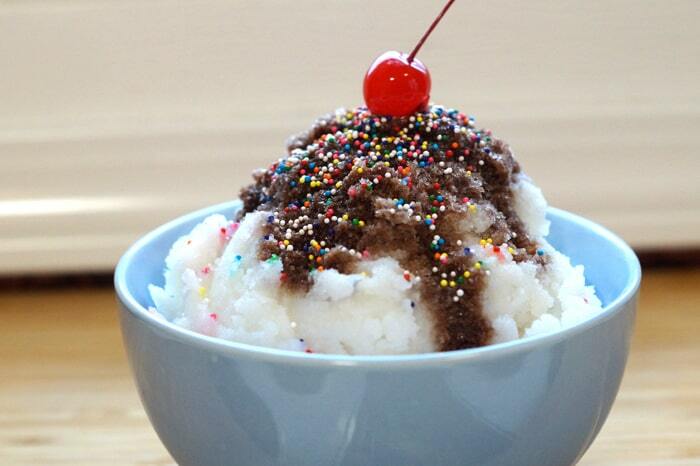 Snow creme is pretty simple, it’s just clean snow, milk, sugar and flavoring. See how we made it during the last Spring Break snowmageddon. Break out the paper, crayons and paint and get creative. Got some leftover craft supplies? 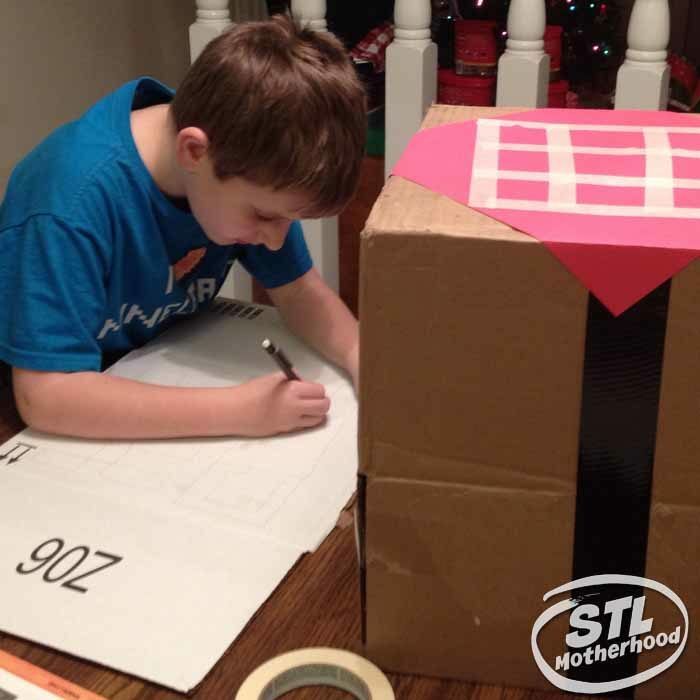 Dump them on the table and let the kids have at it for a no holds barred craft-a-thon. 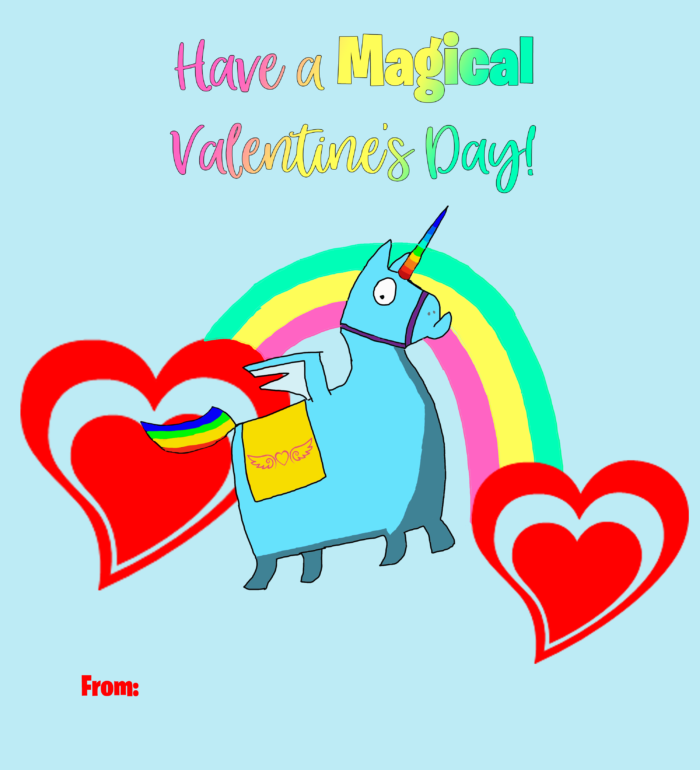 …by making home made Valentine’s Day cards in advance or making bright “stain glass” hearts. Stay warm with some fake snow…paint! 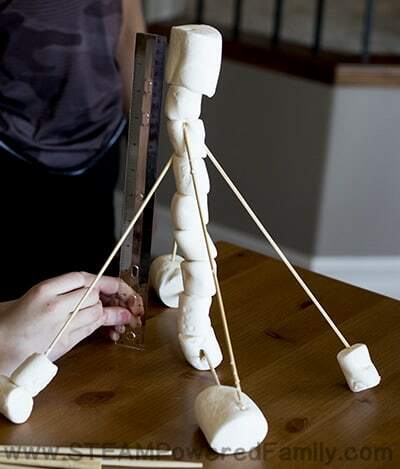 If you’ve got marshmallows, toothpicks and maybe a few bamboo skewers, you can build marshmallow towers–and learn a little science along the way. Sure, you know the basics…but what about a six pointed flake? 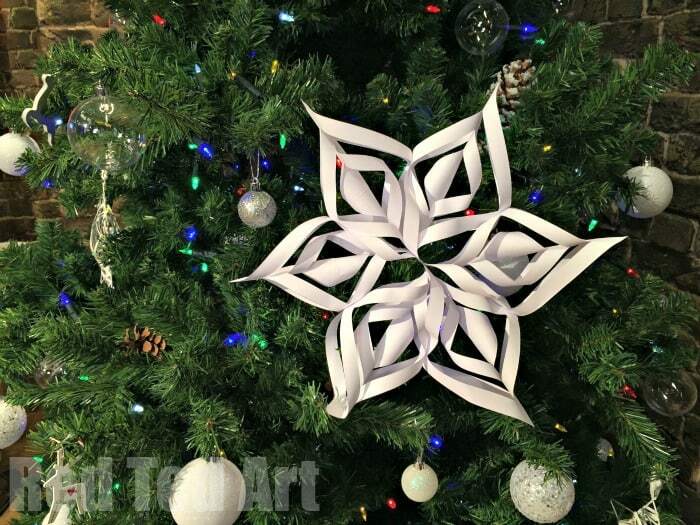 Or a 3D Snowflake?